American Piping Products stocks API 5L pipe in grades B and X42 – X120. Ingots, blooms, billets, coils or plates used for the manufacture of pipe shall be made via basic oxygen, electric furnace or open hearth in combination with a ladle refining process. For PSL2, the steel shall be killed and melted according to a fine grain practice. Coil or plate used for PSL2 pipe shall not contain any repair welds. Pipe to withstand a hydrostatic test without leakage through the weld seam or the pipe body. Jointers need not be hydrostatic tested provide the pipe sections used were successfully tested. No cracks shall occur in any portion of the test piece and no opening of the weld shall occur. X60 with T 500in. There shall be no opening of the weld before the distance between the plates is less than 66% of the original outside diameter. For all grades and wall, 50%. For pipe with a D/t > 10, there shall be no opening of the weld before the distance between the plates is less than 30% of the original outside diameter. For other sizes refer to the full API 5L specification. 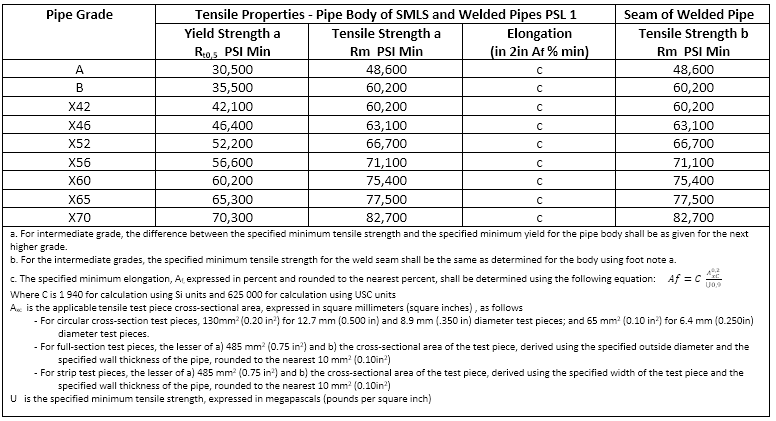 Many PSL2 pipe sizes and grades require CVN. Seamless pipe is to be tested in the body. 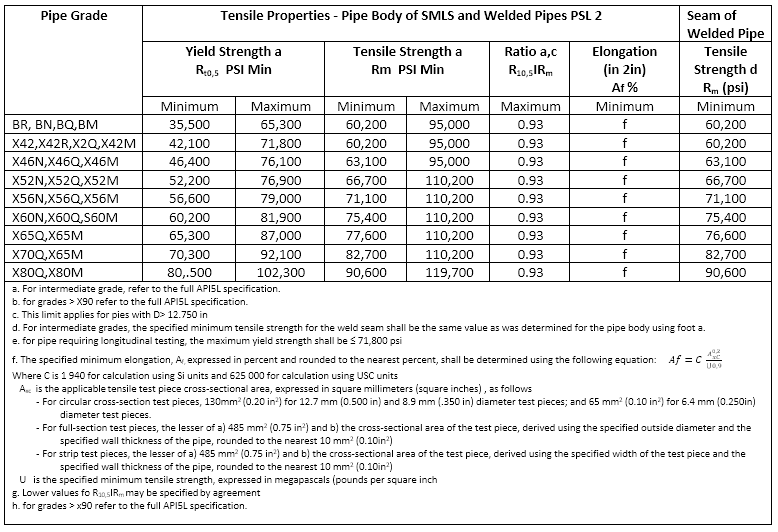 Welded pipe is to be tested in the body, pipe weld and heat-affected zone. 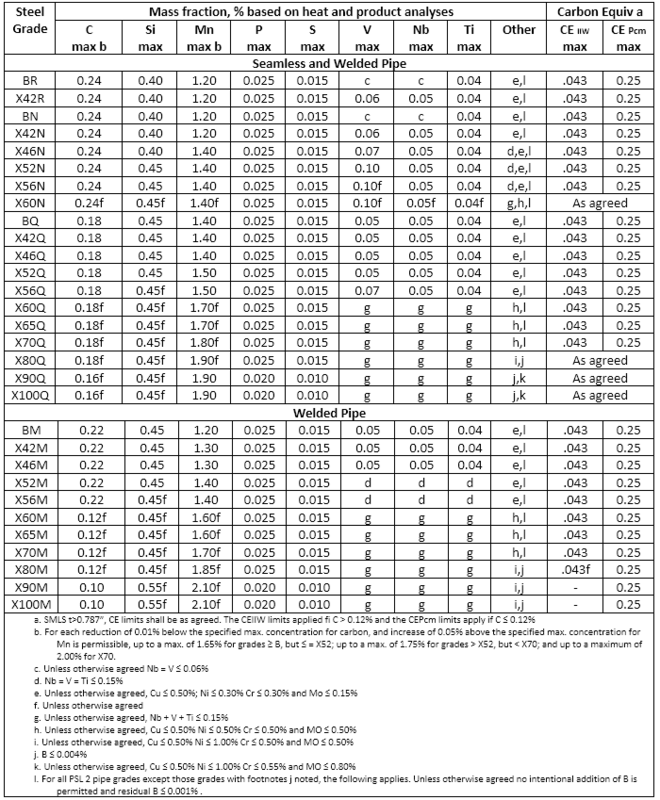 Refer to the full API 5L specification for the chart of sizes and grades and required absorbed energy values. 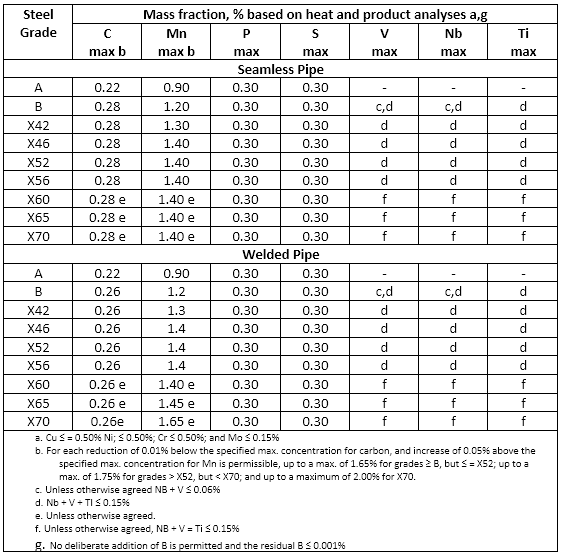 c. For expanded pipe with D≥8.625in and for non-expanded pipe, the diameter tolerance and the out-of-roundness tolerance may be determined using the calculated inside diameter or measured inside diameter rather than the specified OD. d. For determining compliance to diameter tolerance, the pipe diameter is defined as the circumference of the pipe in any circumferential plane divide by Pi. API 5L 45th Edition for full specification including annexes and complete testing and reporting requirements.